In power plant, high pressure and high temperature steam is used in order to increase their thermal efficiency. 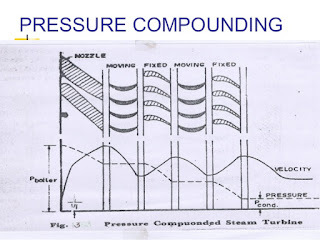 If the entire pressure drop (from the boiler pressure to condenser pressure) is carried out in one stage only, then the velocity of steam entering into the turbine will be extremely high. It will make the turbine rotor to run at a very high speed (even upto 30000 r.p.m) which have a number of disadvantages. In order to reduce the rotor speed, various methods are employed. 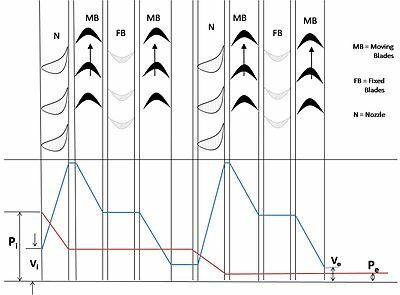 All of these methods consist of a multiple system of rotors in series, keyed to a common shaft and the steam pressure or the jet velocity is absorbed in stages as it flows over the rotor blades. This process is known as compounding. 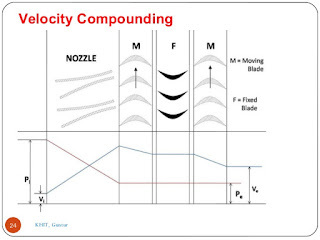 In velocity compounding of an impulse turbine the expansion of steam takes place in a nozzle or a set of nozzles from the boiler pressure to the condenser pressure. The impulse wheel carries two or three rows of moving blades. The steam after expanding through nozzles enters the first ring of moving blades at a high velocity. A portion of this high velocity is absorbed by this blade ring and the remaining passed on to the next ring of fixed blades. The fixed blades change the direction of steam and direct it to the second ring of moving blades, without altering the velocity appreciably. After passing through this second ring of moving blades a further portion of velocity is absorbed. The steam is now directed by the second ring of fixed blades to the third ring of moving blades and then enters into the condenser. It may be noted that no pressure drop occurs either in the fixed or moving blades. All the pressure drop occurs in the nozzles. 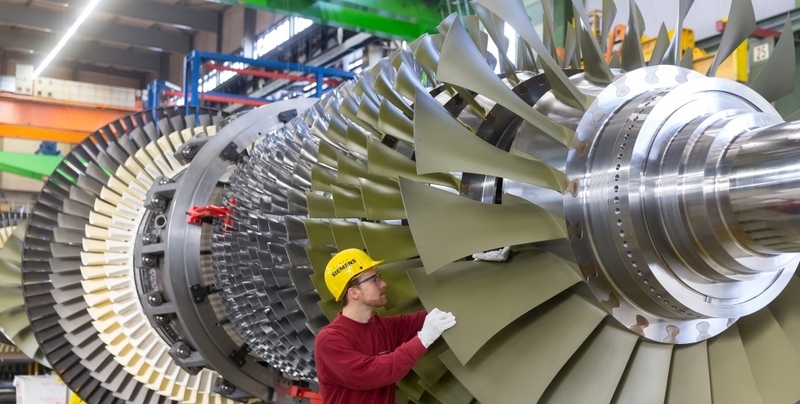 This turbine can run at about one third of the speed of De-Laval turbine for the same pressure drop and diameter of the wheel. In pressure compounding of an impulse turbine the rings of the moving blades each having a ring of fixed nozzles are keyed to the turbine shaft in series. The total pressure drop of the steam does not take place in the first nozzle ring but is divided equally among all the nozzle rings. The steam from the boiler is passed through the first nozzle ring, where only a small pressure drop occurs with an increase in velocity of steam. The steam is now directed on the first moving blade ring where the pressure of steam does not alter, but the velocity decreases. This constitutes one stage. It may be noted that a stage consists of a fixed nozzle ring and a moving blade ring. The steam from the first moving blade ring enters the second nozzle ring, where it's pressure is further reduced. 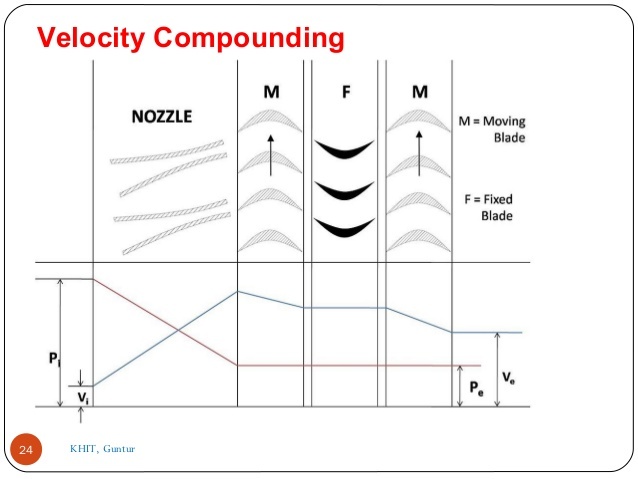 A little consideration will show that the pressure drop per stage in the nozzle rings is not the same but the number of heat units, converted into velocity energy in each stage is the same. The process is repeated in the remaining rings until the condenser pressure is reached. It may be noted that by arranging a small pressure drop per stage the velocity of steam entering the moving blades and hence the speed of rotor is reduced. The Rateau and Zoelly turbines are the examples of pressure compounded turbines. 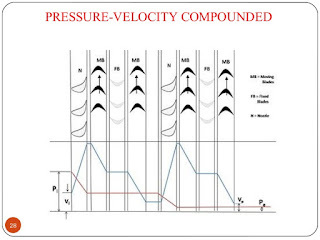 In a pressure - velocity compounding of an impulse turbine, both the previous two methods are utilized. 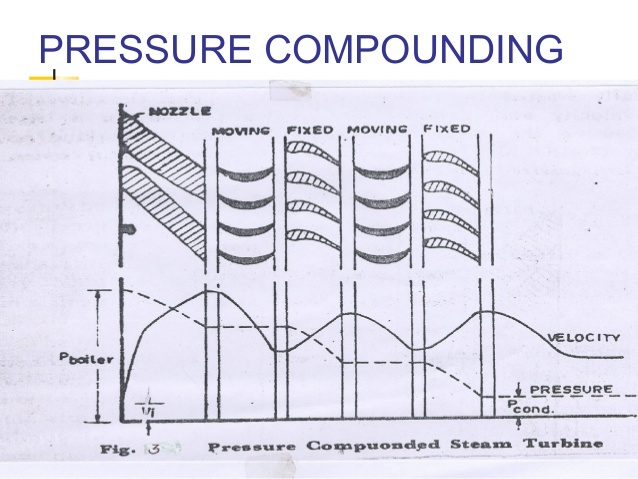 The total pressure drop of the steam is divided into stages and velocity obtained in each stage is also compounded. 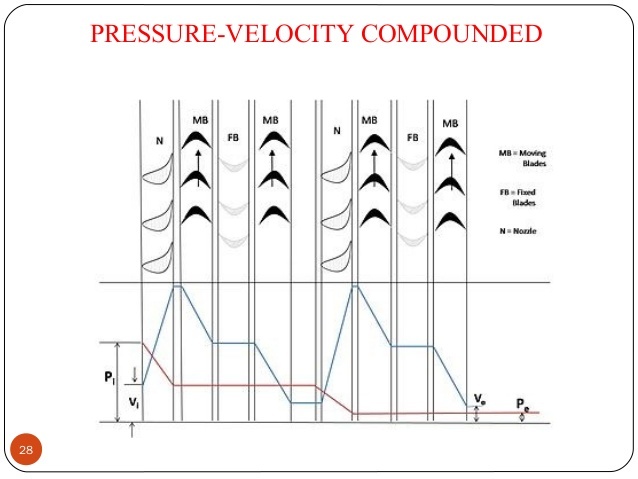 A little consideration will show that a pressure velocity compounded impulse turbine allows a bigger pressure drop and hence less number of stages are required. It may be noted that the diameter of the turbine is increased at each stage to allow the increasing volume of steam at the lower pressures. A ring of nozzles is fixed at the commencement of each stage. A Curtis turbine is an example of pressure - velocity compounded impulse turbine.